Hercules Satele is battling Marques Kaonohi and Larry Sauafea to be one of Hawaii's two starting guards next year. It's a lot quieter these days along the Hawaii offensive line. In the last year-and-a-half, the unit's three most boisterous personalities -- O-line coach Mike Cavanaugh and veteran guards Uriah Moenoa and Brandon Eaton -- have vacated the Manoa premises. Former running backs coach Wes Suan replaced Cavanaugh, who left for Oregon State. 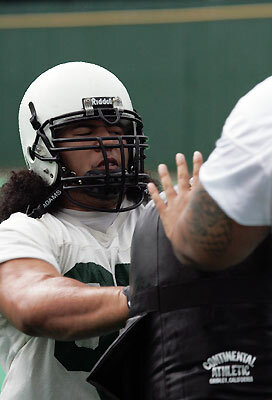 Then Eaton slid over from right tackle to take over for four-year starter Moenoa. Now, with Eaton completing his eligibility last fall, Suan is tasked with finding a new right guard, as well as a left guard since Samson Satele is moving to center in place of another four-year starter, Derek Fa'avi. They aren't doing it in the high-volume manner of their predecessors, but three veterans are stating their cases for the two guard spots. Senior Marques Kaonohi and juniors Larry Sauafea and Hercules Satele are the spring camp contestants. "It's pretty intense," Sauafea said. "We're all close and we've all invested a lot." All three got playing time toward the end of last season. "It's our turn to step up with Derek and Brandon gone now," Hercules Satele said. Suan said he hopes to have a pecking order by the end of camp. "But I think the gap probably won't be so big that someone can't make strides (in fall camp) before our first game," he said. Senior right tackle Dane Uperesa said all three are ready to play. "These guys can do the same (as Moenoa and Eaton)," he said. "They just don't have as much game experience yet." Despite the loss of its vocal leaders, Uperesa said the offensive line is still a tight unit. "We haven't all gotten together lately, but we still do," he said. "We still like to get together because it helps us in the meeting room and on the playing field." "We're trying to become a unit, on and off the field," Kaonohi said. Freshman Raphael Ieru is also getting some reps at right guard. "Raphael will probably be a right tackle, but if you're right tackle you have to know how to play right guard, too," Hawaii coach June Jones said. The Warriors appear to be set at the starting tackles and center with Tala Esera at left tackle, Uperesa at right tackle and Samson Satele at center. But with Samson Satele still seeking clearance to practice, freshmen John Estes and Aaron Kia have been taking the reps at center. "I'm just trying to stay focused and get all my calls down and recognize the defenses correctly," Estes said. "Last fall Derek was like a coach so I'm trying to apply what I learned from him." Diamond days: The intense rain of the past several weeks has turned the Warriors' grass practice field into a quagmire. Former UH special teams coach Dennis McKnight -- who's here on vacation and not in the running for the open assistant's position -- suggested a solution to Jones: Practice at Murakami Stadium. "Dennis said, 'Why don't you go to the baseball field? It made perfect sense," Jones said. "He came all the way here (from San Diego) to tell us that." The stadium and its artificial surface were available, and the Warriors planned to practice there again this morning. It still rained, but the footing was surer than the muddy grass. Jones is from Portland, Ore., known for its rainy weather. But he said he hadn't experienced rain like has hit Oahu the past month. "It's a constant drizzle there. This is a constant pounding," he said.